One way or another, the Obama administration is determined to CAUSE civil unrest and/or panic! Using the trusted tool of the mainstream media propaganda, recent reports of the ‘war on cops’ have once again been distorted. America please wake up. If people would do their own research, perhaps they would find that the results vary, more than often. This totalitarian police state WILL get worse, if we do not think for ourselves, and seek the truth, before listening to the narrative that they are creating FOR us. Right now, if you look at the data, it has been the SAFEST year for police, thus I am led to the only logical answer, the obvious one… There is a war on FREEDOM escalating. The people need to pay attention to this very closely. This course of tyranny will not be easily reversed, if it can be at all. 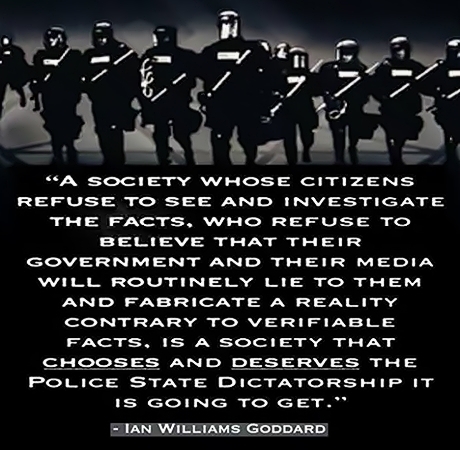 Please take time to see the short video below, accompanied by several article links that are pertinent the present police state in America. The people, trying to hold a highly armed and trained police force accountable, is being twisted by the press. “war on cops” in America today. Nothing could the farther from the truth. Is there really a ‘war on cops’? The data shows that 2015 will likely be one of the safest years in history for police. Vaccine Victory for New York City – So, Why Are Parents Being Kept in the Dark? 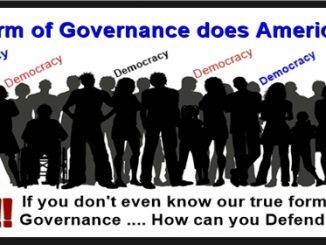 If Most Americans Don’t Know Our Intended Form of Governance … How Can They Defend It?